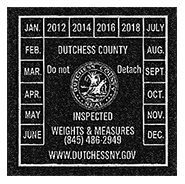 This is the “sticker” that you will see on any devices that we have inspected. Next time you are pumping gas take a look at the pump and you will see the sticker. Most people take it for granted that the items they purchase daily are weighed and measured accurately, and many do not realize how much of what they buy is weighed or measured.